A stylish way to keep warm: this knitted waistcoat by Spieth & Wensky unites traditional folksy design with modern, comfortable clothing. The main body of the waistcoat is made from a coarse, blue purl knit, while large parts of the shoulder areas are made from grey woollen felt, which reinforce its rugged character still further. On the breast, there is an emblem featuring a stag motif, and the wild game theme is continued on the back in the form of an embroidered antler design. Grey stitching and grey trim on the slanted pockets add an interesting contrast, and the traditional costume style is also reflected in the horn-look buttons. 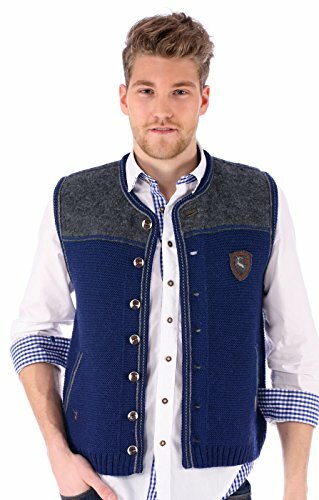 This knitted waistcoat will keep you warm as well as being a stylish item of clothing that you can wear with jeans as well as traditional folk dress. If you have any questions about this product by Spieth & Wensky, contact us by completing and submitting the form below. If you are looking for a specif part number, please include it with your message.